Westford, Mass – Digital Voice Systems, Inc. (DVSI) announced today the availability of a hardware development kit for DVSI's new AMBE-4020™ vocoder chip. The AMBE-4020™ HDK is a comprehensive, evaluation, test and development platform that helps product designers and manufacturing engineers gain experience with low-bit-rate vocoders. The HDK is the ideal reference design for evaluation and test of DVSI's newest half-duplex vocoder chip performance. This multipurpose vocoder tool enables users to explore the capabilities and benefits of the AMBE-4020™ low-bit-rate vocoder in real-time without investing in large amounts of engineering time and hardware prototypes. The heart of HDK is the AMBE-4020™ Vocoder Chip that is embedded with DVSI's patented AMBE+2™ Voice Compression implementation. This voice compression technology has been thoroughly evaluated, tested and implemented by international manufacturers worldwide. The field proven success of the vocoder assures that the developed end product is utilizing the best low-bit-rate high quality vocoder available. By incorporating this advanced vocoder technology into the AMBE-4020™ Vocoder Chip designers can produce low bit rate communication systems that are affordable and power efficient. The AMBE-4020™ Vocoder Chip offers several new features including: an interface for low-cost digital mic, low-power operation and push-to-talk signaling to ease design of half-duplex systems. With a 16-bit ADC and 12-bit DAC built-in, the AMBE-4020™ Vocoder chip simplifies additional hardware requirements. The AMBE-4020™ vocoder chip's small form factor can be easily incorporated into an ultra-low-power base band circuit where circuit board real estate is at a premium. The AMBE-4020™ Vocoder Chip can operate at virtually any data and/or Forward Error Correction (FEC) rates between 2.0 to 9.6 kbps. This allows designers to optimize voice quality and robustness to bit errors to fit within system requirements and operate in the most demanding environments. Plus, the AMBE-4020™ vocoder chip includes a number of advanced features such as: Voice Activity Detection (VAD), adaptive Comfort Noise Insertion (CNI) and support for the detection and generation of single and DTMF tones. According to Robert Maher, DVSI's Director of Sales and Marketing: "By implementing our new AMBE-4020™ vocoder chip into a hardware development platform we are giving engineers and original equipment manufacturers insight on how to use inexpensive widely available circuit components to produce low cost communication equipment with a quick time to market." The AMBE-4020™ HDK goes beyond a low data rate voice compression evaluation tool. The AMBE-4020™ HDK can be utilized as a stand-alone voice processing board, or two AMBE-4020™ HDK vocoder boards may be connected together to easily establish a half-duplex (encoding and decoding) low bandwidth voice compression communication system. The AMBE-4020™ HDK vocoder board is equipped with industry standard connections for fast and easy setup and operation. An RCA jack and a handset connection allow analog voice input/output for encoding/decoding real-time speech. A RS-232 serial port is the data channel that delivers the compressed bit stream between two AMBE-4020™ HDKs for real-time half duplex communication. With the USB interface users can connect the AMBE-4020™ HDK to a PC, to configure the channel interface, encode (record) an analog input to a compressed data file, and decode (playback) previously encoded files. Additionally, the board provides test points for extensive circuit probing and monitoring of data. All these capabilities are ideal for comparing voice quality at various rates, analyzing the compressed voice data I/O stream and establishing customized interface requirements. The AMBE-4020™ HDK is a complete hardware and software package solution, with off-the-shelf availability. 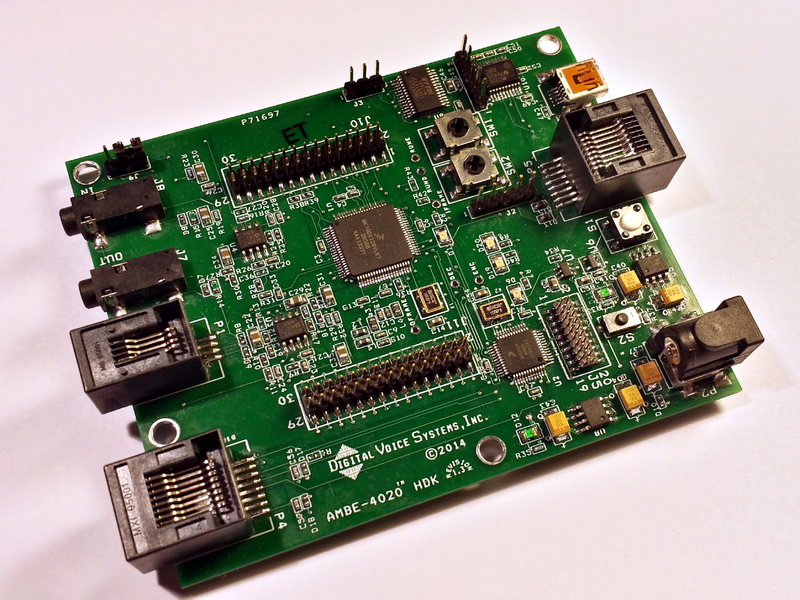 The development kit includes the evaluation board, reference circuit design schematics, as well as, example software. Flexible Bit Rate Selection - High Quality, Speech Compression Data and FEC rates from 2000 bps to 9600 bps. Full Control of AMBE-4020™ Vocoder Chip advanced capabilities - Soft decision decoding, FEC, Voice Activity Detection (VAD), adaptive Comfort Noise Insertion (CNI) and support for DTMF tones. Integrated 16-bit ADC / 12-bit DAC and vocoder in one chip - provides high quality analog audio I/O to an RCA jack (4-wire) and interface and to a handset (2-wire). 5 Volt DC power - Low power requirements with minimal circuit complexity. Additional analog audio I/O interface - Daughter board connection allows for easy integration of an external codec board of your own design. Easy to Duplicate Design - schematic details, example software and reference documentation, provides engineers details for designing custom circuits.